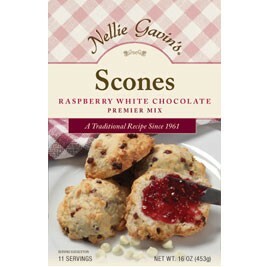 Raspberry White Chocolate Scone Mix - Nellie Gavin's Inc. This wonderful blend of raspberry and white chocolate is a delightful combination of flavors that will sure have your mouth watering. Our traditional scone mix has been passed down from generation to generation, providing a light, moist scone. This Easy 1-2-3 Scone Mix pairs perfectly with your favorite butter or jam. Add Milk, Egg, Butter, Mix & Bake! Makes 11 scones. Net weight 16oz.